UAE 3D printing market is at a niche stage of the industry life cycle; the market posted healthy growth over the last two years. Increasing construction activities especially in Dubai for the preparation of upcoming Dubai 2020 event is one of the key drivers for the rising adoption of 3D printing technology. In addition, 3D printing strategy introduced by the government, flexible labor market, rising innovative technological adoption as well as availability of skilled workforce would further propel the growth of 3D printing market over the coming years. According to 6Wresearch, UAE 3D printing market is projected to grow at a CAGR of 55.3% during 2018 to 2024. The architecture sector is the highest revenue generating sector for 3D printing market in UAE. Binder jetting is the most widely used technology for architectural modelling. In addition, over the coming years, architectural sector is likely to record higher growth, majorly driven by booming construction market in UAE. Additionally, more than $160 billion new projects were awarded for next 3 years. The consumer sector comes second in terms of revenue generation, driven by rising awareness and inclination towards new technology adoption among customers. In terms of number of service bureaus, UAE is a new and emerging market with only 5-6 major players in the region. These service bureaus are only 2-3 years old and there are only three service bureaus which are completely involved in 3D printing. Some of the key players in UAE 3D printing market are- Immensa technology labs, Generation 3D, 3D Vinci creations, 3D creations, D2M Solutions, and Sinterex & Call print. 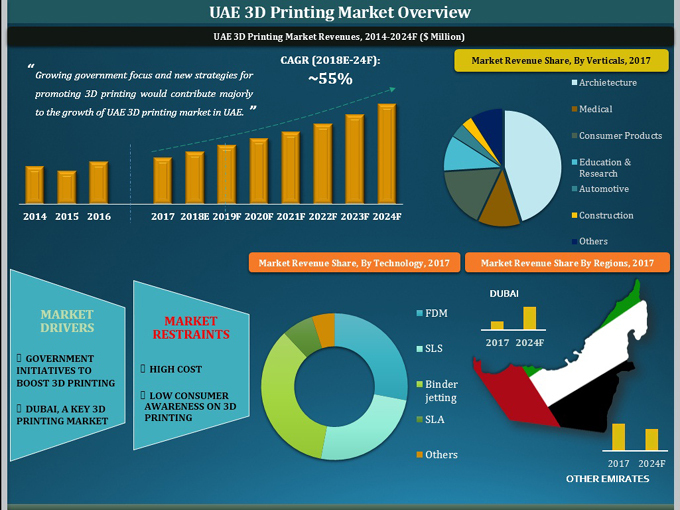 The report thoroughly covers the market of 3D printing in UAE by technology, sectors, and regions. The report provides an unbiased and detailed analysis of the on-going trends, opportunities/high growth areas and market drivers which would help the stakeholders to device and align market strategies according to the current and future market dynamics.